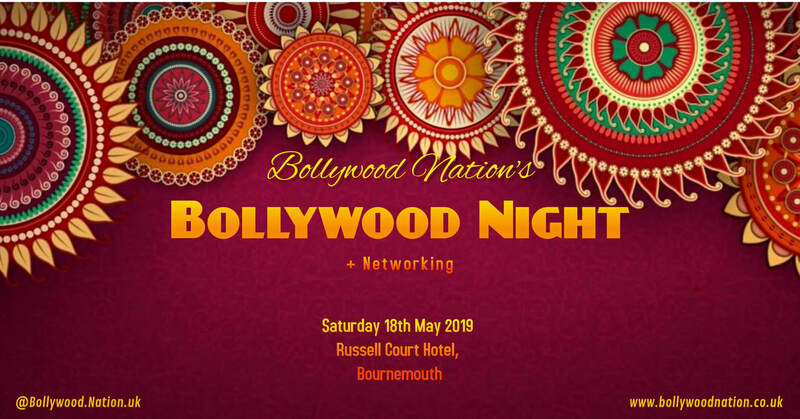 Bollywood Nation brings you a second Bollywood Night + Networking event on Saturday 18th April 2019 at Russell Court Hotel, Bournemouth. DATE : Saturday 18th May 2019. TIME : 8pm to 12am. Doors open at 7.45pm. We have Bollywood Djs Shekar and Trevor playing Bollywood Hits, Bhangra, Music of South Asia and more.. DRESS CODE : Dress to Impress. Smart / Stylish / Sparkly. Please carry your ID. 18s + only. NETWORKING : We have added Networking to this event so business owners and freelancers and can connect with like-minded people. Make sure you carry those business cards, promotion material etc. PARKING : Free off-street parking is available around the venue, 8pm onwards. Parking at the Russell Court Hotel, is NOT free and is chargeable and monitored electronically. MORE INFO : Visit www.bollywoodnation.co.uk or email bollywoodnation@icloud.comedit.